In my opinion, throughout the whole season there has been 2 players that have consistently stepped up for their team, Oklahoma City’s Russell Westbrook and Houston Rocket’s James Harden. Now let’s figure out why they both deserve a shot at the MVP trophy. Westbrook is having a season to remember with 27 triple-doubles to lead the league. Westbrook is playing in his 9th season, averaging 31 points and 10 assists and 11 rebounds. He is shooting 42% from the floor and 34% from 3 point range. Westbrook has led the Thunder to a 32-25 record which puts them at 7th in the western conference. In 32 wins this season, Westbrook has averaged 32 points, 11 rebounds and 11 assists. Westbrook will look to continue to play at a high level, during the 2nd half of the season. Harden who is also having a great season with 15 triple-doubles. Harden has averaged 29 points, 8 rebounds and 11 assists per game. Harden has shot 44% from the floor and 35% from 3 point range. Harden had led the Rockets to a 40-18 record, which is 3rd in the western conference. In 40 wins this season, Harden is averaging 30 points and 9 rebounds. Harden looks to maintain his play and lead the Rockets to the playoffs. 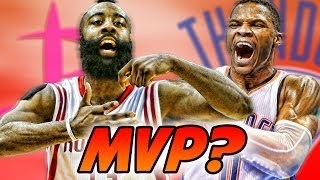 Who is the MVP as of now? Russell Westbrook- Westbrook is the front-runner for MVP at the all-star break. Not only does Westbrook lead the NBA in Triple Doubles, but also in points per game. Westbrook has been one of the most exciting player to watch. From his ability to score anywhere and his speed to go up and down the court, Westbrook is looking to become the 2nd player to average a Triple double throughout a whole season. Oscar Robertson held this title in the 1961–62 season. Westbrook will hope to continue this play so he can win his first MVP award.